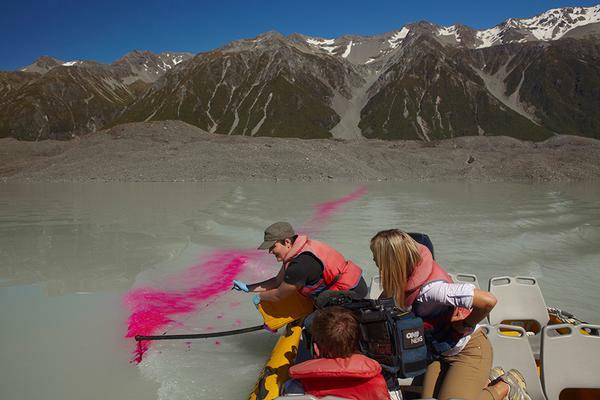 An Auckland fine arts student has highlighted the issue of global warming through an art installation on the Tasman Glacier Terminal Lake at Aoraki Mount Cook National Park. Student Amelia Hitchcock of Elam School of Fine Arts collaborated with scientists Dr Martin Brook and Rob Dykes from Massey University to show the position of the Tasman Glacier terminal face in 1995, 2000, 2005 and 2008. 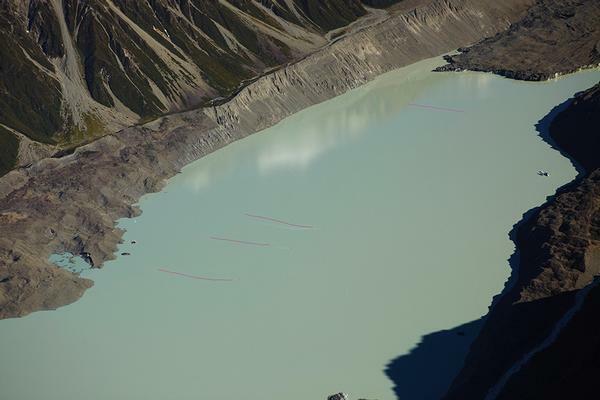 Using specially constructed rigs to distribute soluble dyes into the water from Glacier Explorers boats, she blended art with science to mark the lines of retreat of the terminal face since the lake formed at the base of the glacier in the mid 1980’s. GPS technology identified the rapid retreat of the glacier face over those years, and Ms Hitchcock was helped by a team of volunteers to mark the lines in the water. The lines were marked using Rhodamine WT, which disperses within two hours. At 27km in length, the Tasman Glacier is New Zealand’s largest glacier, but its survival is under threat as it has been in retreat since a mini Ice Age from the 1500’s to the late 1890’s. Ms Hitchcock said she was fascinated by what was happening at the glacier as the terminal lake was “almost the same age” as she was. “When the lake formed, it started as a series of small sink holes, but now it’s just over 6km long. Predictive models indicate the glacier will lose a further 9km over the next twenty years,” she said. “Whereas the intricate science of climate change is often beyond my reach, the recent retreat of the glacier is tangible, measured in my lifetime. Denis Callesen, General Manager Tourism for Aoraki Mount Cook, said Glacier Explorers was delighted to help out Ms Hitchcock to raise awareness of glacier activity. “Each year we see more and more ‘calving’ of ice from the glacier face which results in icebergs of up to 30 million tonne,” he said. Glacier Explorers, which takes passengers on cruises on the Tasman Glacier Terminal Lake, operates up to 7 trips a day beginning at 8am with the last trip leaving at 5pm. The 2 ½ hour tour takes passengers past constantly moving icebergs, some of which can be touched from the boat. The installation was photographed by Mike Langford, a multi award winning international professional photographer now based in Queenstown. Mike is the current Australian Travel Photographer of the Year and The President of the New Zealand Professional Photographers Association.